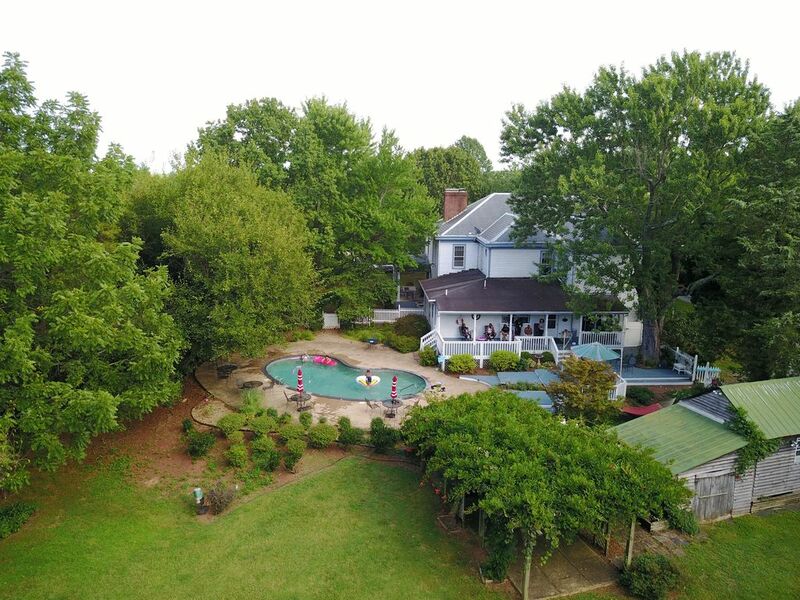 7 BR Manor - 10 min à Lynchburg et Appomattox Parfait pour la famille et les mariages! Lieu de mariage pour 30 à 300 invités, réunions de famille, retraites d’entreprise et de direction, réunions d’entreprise, team building, escapades romantiques et retraites en couple, groupes de 2 à 250 personnes, le Manoir Concord vous attend. Renseignez-vous sur les événements gratuits et les tarifs réduits pour les groupes religieux et les organisations à but non lucratif (retraites du leadership) Concord Manor est un lieu de rassemblement ou d'entraînement particulier pour les athlètes et les équipes sportives, en particulier les triathlètes et les cyclistes confirmés. À distance de marche pour jouer au softball et au basket-ball, à 8 minutes en voiture pour jouer au golf et au tennis. Cette spacieuse maison de 5000 pieds carrés sur un domaine de 5 acres dispose de 7 chambres et de 9 espaces de couchage dans la maison principale. Les jardins, la piscine privée, le grand foyer et la tonnelle à trois vignes avec ventilateurs de plafond vous inviteront à vous asseoir et à vous détendre. En comptant les ventilateurs de plafond extérieurs, il y en a 4 répartis sur le vaste porche, deux sur le porche arrière qui surplombe le pont et la piscine à plusieurs niveaux, et 4 dans la tonnelle adjacente à la piscine. Cet établissement se trouve à 15 minutes de route de l'université Liberty et à 20 minutes des collèges Lynchburg, Randolph College, CVCC et Sweet Briar College et à 45 minutes de Longwood et Hampden Sydney, à 70 minutes d'UVA et à 90 minutes de VA Tech. Le parc historique national Appomattox Court House (10 min), le musée Legacy d'histoire afro-américaine, le mémorial national du Jour J (35 min), le pont Natural Bridge (60 min), les sommets d'Otter (45 min) et Red Hill - Monument commémoratif national Patrick Henry, Smith Mountain Lake (40 min) et Anne House Spencer House & Garden Museum. Le Concord Manor se trouve à 132 km de Monticello, de Thomas Jefferson, et à 300 km du Washington Monument et du Smithsonian Institute, dans le centre de Washington DC. Concord Manor est un endroit de rêve pour les cyclistes confirmés, car les routes de campagne pittoresques semblent s'éterniser, les habitants de la région sont très sympathiques (les conducteurs de voiture et de camion sont polis et attentionnés) et le Blue Ridge Parkway est à la hauteur du défi. ceux qui aiment grimper sur des étendues allant jusqu'à 14 miles continus. Nous avons des cartes des itinéraires recommandés pour vous tous, passez une semaine à faire du vélo et ne changez pas grand chose à voir la région. Bill Carico, agent for this property. Beautiful property! Loved the warmth and character of this old home! The owners are great to work with and so accommodating! The home was a wonderful place for our large family to gather while celebrating my sons marriage! Great place - Plenty of room! We loved our time at the Manor. Concord, VA is out of the hustle and bustle of Lynchburg and a great place for family get-a-away’s. The large home provided enough space for all of our family. We were able to cook a complete Thanksgiving dinner with all of the trimmings and had plenty of room to seat everyone. We stayed for 10 days to explore all of the civil war sites in the local area. Appomattox is just 5 minutes down the road which has grocery stores, a Walmart, and plenty of fast food for those who don’t cook. The owners were on site and very accommodating to our needs. They provided a crib for our new granddaughter and a extra stove to help with our Thanksgiving dinner. Family loved being together in one place. The house is perfect. The kitchen is large enough to accommodate the family being together. We spent our time together sitting around the table for coffee and memories! Beautiful and peaceful visit. We loved how the home was decorated. We thoroughly enjoyed our stay at Concord Manor. The front porch was so comfortable and welcoming and great for long night conversations. We enjoyed our time by the pool. And love how the house was decorated. The beds were the most comfortable we have ever slept in. We hope to come back to Concord Manor again. Charming home, with helpful on property owners, 20 minutes from Liberty University, historic area. We came to the area for a wedding. Rather than get a hotel where there’s no room to socialize, five of my siblings and some of our children and grandchildren decided to rent a house. We loved the description and online pictures. Because we had so many Bill opened up the top floor of the guest house to accommodate us all. We opened the front door and were immediately in love with the place. If you like older homes full of character you will love this place. Furniture, decor, and lighting were chosen with care to enhance the experience. We were concerned with so many of us that four baths would be a hardship, but it was not. The master baths on each floor also had public access. We brought a makeup mirror for hall table so bathrooms left open. There are so many places to congregate. Both sides of the entry have LRs. We also used them for some of my single nephews to sleep. There’s a large sectional that slept two. The other has a queen sleeper sofa. We brought our own air mattresses but they have some and cots. There are pocket doors for privacy. One living room had connecting doors to the MB’s sitting area with a sofa and two chairs. It was nice and private for serious conversations or a nap. The master bed has a beautiful elevated king bed. There’s a large dining room. Many gathered around the kitchen table and counter. The kitchen is great! The back deck was always occupied. There were 3 ceiling fans which helped keep the bugs away. Bill warned us to bring spray since that area of VA has lots of bugs, especially after it rains. They weren’t bad except some of the grassy areas where gnats abounded. The pool was beautiful with a wide concrete deck that had round tables and chairs. The pool is lighted at night and was a popular spot. My sister in law hosted the rehearsal dinner there and they had everything she needed. They also cater events. With three refrigerators there was room for her food as well as what we needed to feed the house for four days. If reliable internet is crucial you might want to check with Bill to see if he’s installed a booster in the house. It also was not strong. Cellular reception was excellent. Those who like peace and quiet enjoyed reading on the front deck. There’s plenty of space for parking. The kids played games on the expansive lawns. Thanks to a local winery, DeVault Family Vineyards, for two bottles of delicious wine. My picky family all loved it! Thanks Bill and Patty! Rustburg, centre-ville de Lynchburg. À seulement 50 minutes de la station de ski Wintergreen, à 70 minutes de Charlottesville et à 45 minutes de Longwood et Hampden Sydney à Farmville. Anne Spencer House & Garden Museum, le musée Legacy d'histoire afro-américaine. Mémorial national du jour J, pont naturel, sommets d'Otter, Red Hill - mémorial national Patrick Henry et lac Smith Mountain.